At the time of the interview, Catherine was starring as Annabella Schmidt/Pamela/Margaret in The 39 Steps at The Criterion Theatre in London’s West End. Catherine’s first acting job was at the age of 11 in the BBC children’s drama Uncle Jack, and one of her first stage roles was at the age of 15 playing Ilse in Spring Awakening at the RSC. Since then, Catherine has appeared in many television programmes including The Sarah Jane Adventures, House of Anubis, The Bill, Doctors, Eastenders, Holby City, My Family, Rosemary & Thyme and Peak Practice. Her stage credits are extensive and include Twelfth Night, A Midsummer Night’s Dream, Hamlet, House of Agnes, The Country Wife, ’Tis Pity She’s a Whore and Spring Awakening. Catherine is also a producer with the new theatre company BAZ Productions, whose most recent play was Macbeth. Taking time out this week from her very busy schedule, Catherine answered some questions about herself and her career. Enjoy reading this fascinating interview! Did anyone in particular inspire you to embark on a career in performing arts? I first got excited about performing as a result of doing plays at Prior Weston, my primary school. It was such a lovely environment with a really creative vibe, and Lesley Brook our teacher who trained at Central and directed the plays, was a legend. She helped me with my audition piece for Italia Conti and was so encouraging. I was extremely lucky to know a teacher as funny, clever and inspiring as she is. As well as Italia Conti you also attended Bridewell Youth Theatre and Junior Guildhall. What was the best way that your training prepared you for your professional career? It’s quite an eclectic way of training isn’t it! Italia Conti was useful as there was an agency attached to the school so we got used to going for auditions and getting (or not getting) jobs. We did a lot of improvisation that was great fun, and got us used to taking risks and being brave. I remember a lot of the improvisations being terrific – young people have such great imagination. The dancing and singing was fun too and has helped me so much; actors are often required to know how to move well and to have some musical skill. The Guildhall course was focused solely on acting, so we did scene studies on texts from Shakespeare to Caryl Churchill, and I learnt so much from Alasdair Middleton our teacher (who recently wrote the libretto for The Enchanted Pig at the Young Vic and ROH). I made some amazing friends at Guildhall who are now all successfully involved in the theatre in some way. Your first acting job was in the BBC children’s drama Uncle Jack at the age of 11. What can you remember of this experience? I loved working at the BBC – running around in the 1950s Television Centre was lots of fun! I am gutted they are relocating. It was the first purpose-built TV centre in the world and is so evocative of a golden age of British television. We were also lucky enough to rehearse in the now demolished BBC rehearsal rooms in Acton. This was a purpose-built building also with a canteen on the top floor where you would regularly see famous actors having their lunch and chatting; I remember it being a real community. When I wasn’t being tutored (an obligatory part of a child actor’s life if they are missing school) I would peek into rehearsal rooms. I remember seeing the cast of Absolutely Fabulous rehearsing and was so star struck I didn’t know what to do with myself. Despite the fun of it, it was quite difficult going back to school after being in such an adult environment, and vice versa. If you are under 16 you have a chaperone, but that didn’t stop the director having a go at me on my very first day because I didn’t have a pencil on me to mark notes on my script.… At the time I was devastated and thought it harsh, but I have forgiven him now… just! At the age of 15 you played Ilse in Spring Awakening at the RSC. This is often considered to be a controversial play, what were your thoughts on it at the time? Spring Awakening is a children’s tragedy and Tim Supple, the director, made the brave choice of casting actors of the age of Wedekind’s characters, so we were all between the ages of 12 and 15 – normally older actors are cast in those roles. Our parents had to sign a special contract saying they understood the nature of the piece. My parents have always been utterly supportive in what I do so that wasn’t a problem, and we were very well looked after on that job. We had weeks of voice and movement work with the RSC before we even started work on the play itself that was a new translation by Ted Hughes who was the poet laureate, and was often present in rehearsals. It was an intense experience and as a cast we became very close – I made friends that are still very dear to me! The play itself is so important and I love the genre of Expressionism in visual art as well as literature, and so getting to play Ilse, often described as being like Wedekind’s Lulu before her time, was a gift. You have many notable television credits including; EastEnders, Doctors, Holby City, Peak Practice, My Family, House of Anubis and The Bill. Which television roles have been the most rewarding? I am rather proud of a TV series I did about 10 years ago called Residents for BBC 2. It was written by Tony Basgallop and was billed as an ‘anti-soap’. It had very extreme, colourful characters who clashed with each other outrageously, in a way not dissimilar to Shameless. For example, a racist bigot in an unhappy marriage to an alcoholic wife with a pregnant teenage daughter, lived next to an Indian family where the patriarch had just set fire to his own shop to claim on the insurance, and his son was having an affair with the local rough family’s slutty daughter (played by me!). It was a very brave series, and was so well executed. It also featured a young, pre-hollywood Jim Sturgess as the local stoner! You have appeared as P.C. Shona Blake in EastEnders on several occasions. How does it feel to perform in a national soap programme seen by millions? EastEnders is fun to do because it is so fast and organised – like a well-oiled machine! However my first episode was a night-shoot that involved having to separate a fight between Pat Butcher and Shirley Carter. That was scary! You performed as Esther Robinson in the 2011 TV series House of Anubis. How do you adapt your performance from the stage to the camera for programmes like this? I would say everything just needs to be smaller, and vocally you don’t need to project as you would to a 500-seat theatre obviously. But because it is not as ‘big’ as theatre it doesn’t mean the energy can take a dip – that has to be kept alive too, even if you are doing endless takes of the same thing. Unlike performing a play in a live venue, with filming your story is often shot out of sequence so you have to keep in mind your character’s journey. Also, there are often script changes made at the last minute so you have to be on the ball and be able to learn new lines quickly! The crossover happens when you are filming something in front of a live studio audience, such as when I did My Family for example. In that scenario you have to account for the live audience reaction while remembering you are performing for a camera – it is quite a skill! Television and theatre combined when you played Helena/Snug in a memorable performance of A Midsummer Night’s Dream at Middle Temple Hall that was accompanied by the music of Mendelssohn and shown on the BBC. How would you describe the occasion and also the experience of acting on a stage where Shakespeare had performed? That was such a joyful job for so many reasons. I got to work with some of my favourite people, including director Tim Carroll. He has a great approach to verse and he is so damn knowledgeable you feel in very safe hands, even though the work is knackering because he never lets you off for a second. Mendelssohn’s music is incredibly beautiful and it helped that Charles Hazelwood, the conductor, and the orchestra were very open to what the actors were doing, it felt like a proper collaboration. I am very proud of that production, and it felt magical to be performing in Middle Temple Hall where the first recorded performance of Twelfth Night was performed – that’s a pretty awesome feeling for an actor! You have performed ten roles from Hamlet in various locations such as bars, churches, pumping stations, festivals and theatres including The Hampstead Theatre, The King’s Head, The Globe, York Theatre Royal, The Victoria and Albert Museum and The Barka Theatre, Budapest. What advice would you give to young actors who have to perform in diverse venues? It is good experience to perform in lots of different venues as you get adept at finding out how a space works – where to stand for the best light, acoustic etc – especially if the production is improvised or promenade. I recently produced Macbeth with BAZ Productions, my theatre company, in a 17th century crypt in Holborn. It’s great using such an atmospheric venue but the actors, director and designers have to figure out how best to use the space or it goes for nothing. We just got nominated for four Off West End Awards so it looks like we did something right! Your stage credits include appearing in the West End, and many fairly small venues. Where do you feel most at home and which has been the most unusual venue? ‘Tis Pity She’s a Whore at The Young Vic was in the round, so the audience felt very much a part of the action. The set was unusual, consisting of two highly raked floors juxtaposed against each other with red sand all around the edge. This made the actors a bit off-balance, but I think it helped convey a sense of unease at the heart of the play. I was very happy working on that production – as a 19 year-old it was dead exciting working with Jude Law and Eve Best! Bizarrely I think the venue I felt most at home in was the biggest venue I have played – the 1900-seater Hackney Empire, with Steven Berkoff in his play Sit and Shiver. Visit that place if you can as it is stunning and dripping with history; Charlie Chaplin, Stan Laurel and Marie Lloyd performed there. It was built by Frank Matcham and as well as looking exquisite, you can hear someone speaking even at a low volume from the stage wherever you sit in the auditorium because he was a master of acoustics. In 2011 you appeared in a short film called Secrets. Do you enjoy this type of dark humour? I thought Steve Bloomer wrote a terrific script that originally was conceived as a short play to be performed live with actors swapping the roles over each time. It is such a clever piece and even though it is dark, that isn’t the best thing about it – to write a witty, engaging piece that is robust enough for an actor of any age, race or gender to play either role is pretty special I think. You are currently performing as Annabella Schmidt/Pamela/Margaret in The 39 Steps at the Criterion Theatre. Can you tell us about your characters? They are all such fun to play, and I love the fact that they are all heroic in some way. It is such a treat to play three women who are active, gutsy and important to the plot, and Patrick Barlow has done this wonderfully well. I will try not to give too much away but I’ll start with Annabella who is a German double agent trying to prevent some vital information from leaving England and getting into the wrong hands. She is played in the Hitchcock film by a beautiful actress called Lucie Mannheim who brings with her an air of the Weimar Republic – she was the real deal, born in Berlin in 1899! My second character is Margaret, the down-trodden wife of an older, brutal, Scottish farmer. She turns out to be very brave indeed, and like Annabella, takes the ultimate risk for what she believes in. Then there is Pamela, who finds herself entangled in Richard Hannay’s chaotic antics, and is often furiously at odds with him, with the rather inconvenient factor of finding him incredibly attractive! She strikes me as a fiercely independent woman who spends a lot of the play fighting her corner and trying not to give in to her feelings for him, so she is very gutsy. What is it like performing in such an action-packed comedy? It is great fun and a real adrenaline rush to get such an effusive response from the audience. I am also very lucky to be in such good company – namely Andrew Alexander, Stephen Critchlow and Ian Hughes. We get on very well in real life and it makes performing the play like a sort of tag team, everyone ends up being responsible for getting to the finish line! I would say it is tiring but in a good way, it feels like you’ve done a good day’s work at the end of the show! John Buchan wrote The 39 Steps in 1915. Why do you think the storyline has ‘stood the test of time’? John Buchan’s original story is different to Hitchcock’s film that in turn is different to the Kenneth More film, and then the Robert Powell one. I think the eternal story of the unlikely hero on the run while saving the country is the main appeal – throw in some suspense and espionage and you have a hit! Why should everyone go along and see The 39 Steps? When I saw my friend John Hopkins play the role of Hannay a few years back I loved it because it relied on the basic elements of a brilliant script, clever direction and good actors – and that is all! The designer has captured the spirit of Film Noir and despite it being a pastiche I think lovers of that genre will adore it. Also, it is hilarious. I laughed until my face hurt when I first saw it. It is such a joyous piece full of intrigue, romance and mischief that we get everyone from children to grandparents loving it. Looking ahead, do you have any particular career ambitions or ‘must do’ plays? This summer I played Viola in Twelfth Night and it whetted my appetite to do more Shakespeare. I would love to have another go at playing Rosalind in As You Like It – we did an unrehearsed cue-script version with Tim Carroll a couple of years ago that was a blast – former Hannay John Hopkins was in it as the funniest Touchstone I think I’ve ever seen. Do you have a favourite Shakespearian play? Hm – this is difficult. I adore Henry V, because when I saw Kenneth Branagh’s film back when I was nine, it was one of the reasons I wanted to act, I loved him in it, and the way he directed it, and I totally fell in love with Emma Thompson too! I also have a soft spot for Macbeth. As I said earlier I produced it with BAZ and I am always struck by how it zips along. It is Shakespeare’s shortest play, and yet it is packed with action; it reads like a thriller. Away from the stage, I gather that you enjoy painting, drawing and also do illustrations for Dennis Publishing. What do you like to draw and what medium do you like to use most? I used to carry a sketchbook everywhere so it was mainly pencil sketches when I was out and about – on the tube and stuff, but lately I’ve got into painting from photographs using acrylics on canvas. Do you have a drawing that you would like to share? 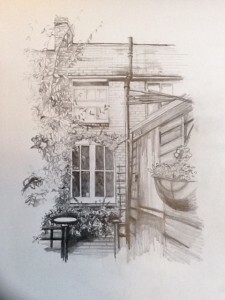 This is a sketch of the charming house I stayed in when I was doing Twelfth Night at the Ludlow Festival this summer. What else do you like to do to chill out? See my friends and family, and spend quality time with my amazing fiancé! What style of music do you like to listen to most? Anything from classical to hip hop! Recent albums I have bought include Laura Marling and Cosmo Jarvis but at the moment I am listening to Martha Wainwright singing Piaf live – she is insanely good, she rasps through the songs with such drama and is clearly an accomplished musician. Do you have any message you would like to say to your supporters and fans?